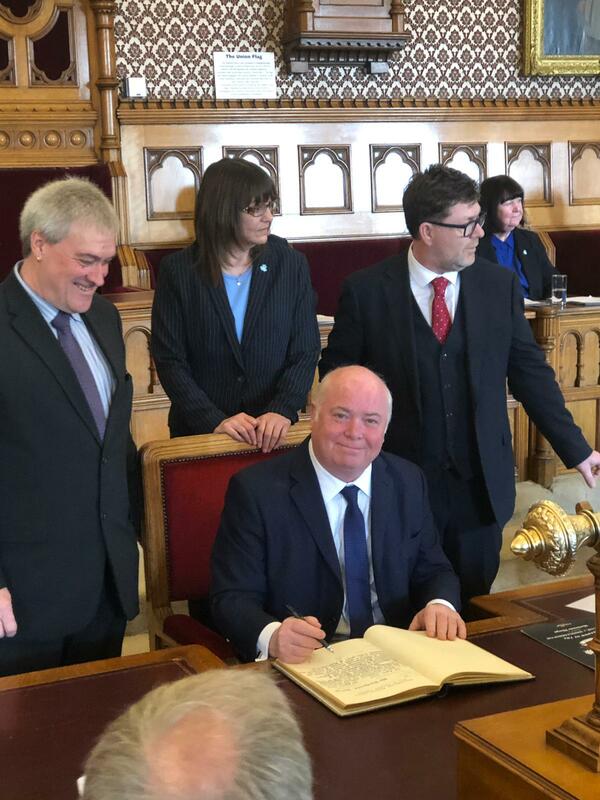 Mackenzie Thorpe said he feels ‘part of a family called Middlesbrough’ after he was granted freedom of Middlesbrough at a ceremony at the town hall. The town features prominently in many of Mackenzie’s artworks with his childhood memories and experiences in the industry of the area a source of inspiration to this day. This has resulted in Mackenzie showing Middlesbrough to the world when he exhibits artworks of the town from America to Japan. Mackenzie’s links with Middlesbrough strengthen further recently after he unveiled his latest sculpture, Waiting For Me Dad, in front of an assembled crowd at the foot of the Transporter Bridge. “There are so many layers of gratitude that I have for you all. That you should pick me out of all the hundreds of people from Middlesbrough and give me this award is beyond me. “We are as proud of you, as you are of Middlesbrough. You bring people together, which is quite an art in itself. “Your story and the way you explain it gives hope to many young people in our town and the ways in which you link the past, present and future tells our story so well.